Lewis Hamilton on Top with the Red Bull Close Behind: Formula One world champion Lewis Hamilton returning to the top of the timesheets in second Spanish Grand Prix practice on Friday, with the charging Red Bulls of Daniel Ricciardo and Max Verstappen hot on his heels. The Briton, who is leading the championship by four points from Ferrari’s Sebastian Vettel after four long-haul races, lapping the Circuit de Catalunya in one minute 18.259 seconds on the soft tyres. Australian Ricciardo’s car has some eye-catching aerodynamic upgrades for the start of the European season and ends 0.133 seconds slower after crashing in the morning, while Verstappen was the third. The two Red Bulls are colliding in Azerbaijan two weekends ago and are under the scrutiny by team bosses who can intervene if the rivalry risks overheating again in Sunday’s race. Vettel who is chasing his fourth successive pole position on Saturday was fourth and Hamilton’s teammate Valtteri Bottas fifth. Vettel’s teammate Kimi Raikkonen suffering power unit problem. Bottas set the day’s overall fastest lap in the opening session with a time of 1:18.148 seconds on the soft tyres. A remarkable 0.849 faster than Hamilton who won from pole in Spain last year. Hamilton has not feel entirely comfortable with his car and knows his championship advantage owes a lot to luck. 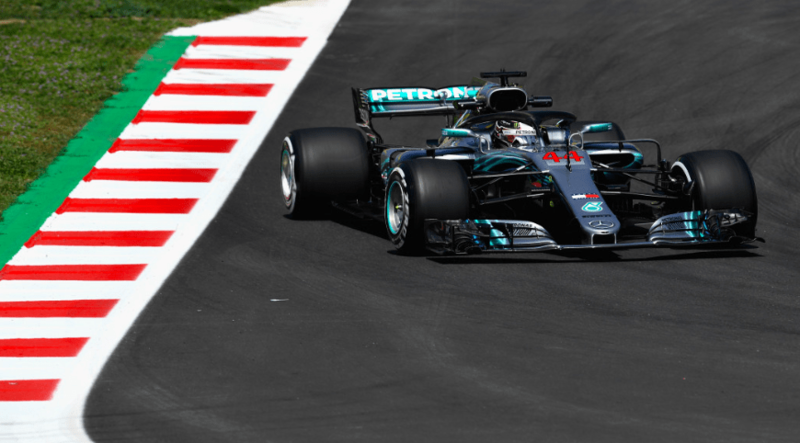 The day was pretty good, but it was a tricky one because it was so windy out there, says the Briton, who had gifted a win in Baku two weeks ago when Bottas had a puncture in the closing laps while leading. Every driver was struggling with the changing direction of the wind. You are continually arriving at each corner, and the wind direction is never the same, so we saw lots of drivers going off. These conditions will make it very difficult to define where the set-up needs to go. The virtual safety car was deployed in the morning when Ricciardo’s car ran across the gravel and into the barriers. Thankfully, the damage is pretty light; team principal Christian Horner told Sky Sports television. It was the old front wing, so he is a lucky boy. Home hero Fernando Alonso is starting the weekend a morale-boosting sixth, behind Raikkonen, with his McLaren displaying a heavily-revised three-pronged nose one of several necessary upgrades around the pit lane. The Spaniard is later slipping back to 12th. Ferrari meanwhile caught the eye with wing mirrors mounted on the halo head protection device as an experiment. Williams had another trying session as Polish reserve Robert Kubica took part in a race weekend for the first time since the year 2010, three months before he is suffering severe injuries in a rally crash. The former race winner was 19th, in 1:21.510, and faster than teenage Canadian teammate Lance Stroll, who was in the last place on the timesheets with a best of 1:22.756 after his car went off into the gravel. Kubica’s car had a newer floor than Stroll’s, however. Unbelievable how bad the balance is, Stroll complaining over the radio. Kubica was replacing Russian rookie Sergey Sirotkin, who is returning for second practice and was slowest in 1:22.060. So, these are the points to describes on the Lewis Hamilton on Top with the Red Bull Close Behind. Suggest your comments from the Article.